The patented design of the Evoluent Vertical Mouse 4 eliminates forearm twisting and helps reduce the muscle tension created in the forearm, neck and shoulder that an ordinary mouse may cause. The familiar two-button grip design with a center scroll wheel and comfortable, easy-to-reach programmable buttons provide an easy transition from a traditional mouse. Vertical mice allow you to relax your grip on the mouse with a "handshake" ergonomic grip and to work comfortably at your computer for longer periods in a neutral wrist position. Available in right-hand wired and wireless mouse versions as well as a wired left-handed mouse. 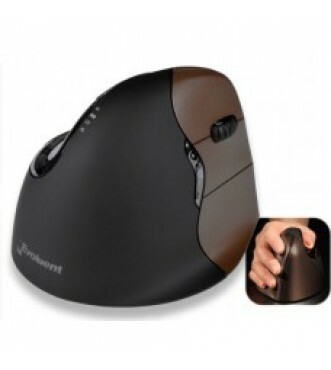 The Evoluent Vertical Mouse 4 regular size models are for hands at least about 7 inches or 178 mm from the tip of the middle finger to the wrist crease. Hands less than 7 inches (178 mm) may be more suitable for the new VerticalMouse 4 Small. 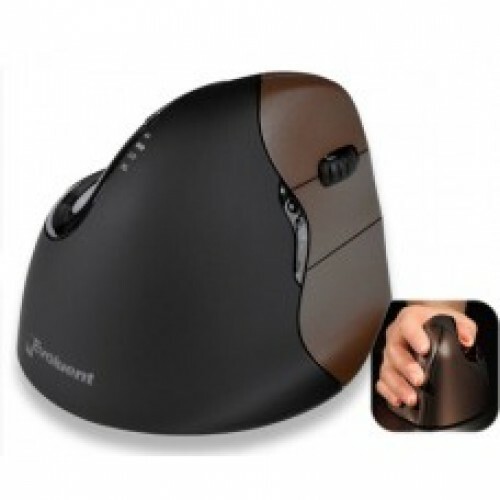 This petite mouse fits users with small hands to provide a more comfortable and relaxed grip. Now two thumb buttons: A new bottom thumb button provides greatly extended functional when used with the included driver. Adjustable optical sensor: Pointer speed control on the side allow convenient adjustment without even releasing your grip from the mouse. Improved thumb rest: The thumb rest has been reshaped to provide even more comfort over earlier versions. extra-low (XL), low (LO), medium (MD), to high (HI). Extended lip prevents rubbing: An extra-wide lip along the bottom edge prevents the last finger from rubbing the desk. Lighted Evoluent Logo: The logo is pure eye candy. The illumination turns off when the system is in sleep mode to conserve notebook battery power. 6 programmable buttons through a simple and intuitive interface. Mini Receiver (on wireless mice only): The tiny 2.4 GHz receiver avoids being knocked off the side of a notebook computer.